How do animals show fear? Fear is a physiological, behavioral, and emotional reaction to stimuli that an animal encounters. The physiological reaction results in an increase in heart rate, increased respiratory rate (panting), sweating, trembling, pacing, and possibly urination and defecation. Behaviorally, an animal will exhibit changes in body posture and activity when afraid. The animal may engage in an avoidance response, such as fleeing or hiding. A fearful animal may assume body postures that are protective, such as lowering of the body and head, placing the ears closer to the head, widened eyes, and tail tucked under the body. If the animal perceives a threat, the response can also include elements of defensive aggression. Whether an animal fights or flees when frightened depends on its genetic predisposition, previous experience (what it has learned from similar situations in the past), and the environment that it is in (see below). The emotional reaction in animals can be difficult to gauge because animals are nonverbal. However, by observing body postures and facial expressions, it is possible to conclude that an animal is afraid. On the other hand, pets may modify their behavioral responses with repeated exposure to the stimulus if the stimulus has been successfully removed by aggression or if escape has been successful. Therefore, what you see at the present time may not be the same as when the problem first began. Is fear ever an abnormal response in animals? In many situations, it is “acceptable and understandable” for an animal to be afraid. However, there are times when animals exhibit fear when it is maladaptive or dangerous for humans. When animals are frightened, they may become aggressive (fight), run away (flight), or stay still (freeze). The response a pet exhibits depends on the pet’s personality, the type of stimulus, previous experience with the stimulus, whether the pet is on its own property (where it is more likely to fight), whether it is in the presence of offspring or family members (where it is more likely to fight), or whether it is cornered or restrained and unable to escape (where it is more likely to fight). Whether an animal fights or flees when frightened depends on its genetic predisposition, previous experience, and the environment that it is in. This is an intense response to a situation that the animal perceives as fear inducing. The response is out of proportion to the stimulus and is maladaptive. Common phobias in animals involve noises and places. Phobic responses have physiological, behavioral, and emotional responses similar to fear, but they are extremely exaggerated. The human definition of anxiety is a diffuse feeling of impending danger or threat. It appears that animals can exhibit this diffuse type of anxiety, often manifested as generalized anxious behavior in either specific situations (the veterinary hospital, new locations) or in a nonspecific way (anything out of the routine schedule or environment). Anxiety is manifested by some of the same physiological signs as fear but also may be displayed as displacement or redirected behaviors, destructive behaviors, or excessive vocalization and may become stereotypic or compulsive over time. What types of stimuli might trigger fears, phobias, or anxieties? The triggers for these behaviors are as varied as there are breeds of dogs and cats. Animals may be frightened of people, other animals, places, or things. Others may only respond with fear or phobia in one particular situation such as toward a thunderstorm. What causes fearful, phobic, or anxious responses? Sometimes fear is the result of an early experience that was unpleasant or perceived by the animal as unpleasant. If the fearful response was successful at chasing away the stimulus, or if the pet escaped from the stimulus, the behavior has been rewarded and therefore is likely to be repeated. Owners who try to stop the behavior by providing treats or affection may not help calm the pet or diminish the fear and anxiety. In some situations, the animal may see your actions as reinforcing the behavior the animal is performing at that time. Also, it should be noted that punishment, in close association with exposure to a stimulus, might further cause fear and anxiety toward that stimulus. If the owner is frustrated or anxious or the stimulus is threatening, this too will further aggravate (and justify) the fear. Finally, if the stimulus retreats or is removed during a display of fear aggression, the aggressive display will have been reinforced. It does not always take an unpleasant experience for fear to develop. Any stimuli (e.g., people, places, sights, sounds) that a dog or cat has not been exposed to during its sensitive period of development, which is up to3 months of age in dogs and 2 months of age in cats, may become a fear-evoking stimulus. For example, the dog or cat that is exposed to adults, but not to children, during development may become fearful when first exposed to the sights, sounds, or odors of young children. 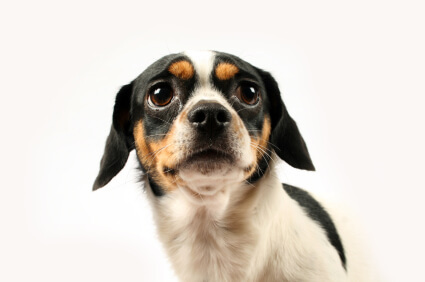 The pet’s genetics also contribute to its level of fears and phobias to stimuli. Phobic responses can occur from just one exposure or gradually increase over continued exposure. In many cases of anxiety, neurotransmitter (brain chemical) function and levels may be altered and contribute to the overall behavior. Again, learning or the consequences that follow the phobic response (rewards, escape, punishment) may aggravate the problem. Illness, pain, or the effects of aging may lead to an increase in fear or anxiety in situations where there was previously little or no problem. These changes may alter the way a pet perceives or responds to a stimulus. Age-related changes in the brain (cognitive decline) or in the sensory system (hearing, sight), arthritis, diseases that affect the hormonal system such as an increase or decrease in thyroid hormones or an overactive pituitary gland (Cushing’s), and organ degeneration (liver, kidneys) are just a few examples of health- and age-related problems that might contribute to increasing fear and anxiety. A full physical examination and diagnostic tests, if indicated, are warranted for any pet with fear or anxiety, but especially those that are intense and generalized, that have any other concurrent signs, or that did not arise until adulthood or older age. Is it possible to prevent fears, phobias, and anxieties? A good program of socialization and exposure to many new and novel things while an animal is young can be helpful in preventing fears and phobias. However, there is a phenomenon called “one trial” learning, where an event is so traumatic that only one exposure can create fears, phobias, or anxieties. 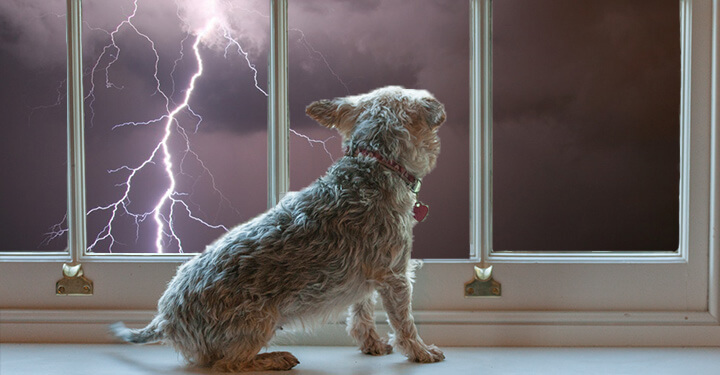 Owner responses when their pet experiences a new situation that could potentially be frightening are important. Calm reassurances; happy, cheerful tones; and relaxed body postures of owners help pets experience new things without fear. Bringing along treats and play toys and giving them to the pet when it enters new environments (e.g., veterinary clinic, schoolyard) or when it meets new people or other pets can help turn the situation into one that is positive. However, if the animal is not calmed by these things, then removing the pet from the situation might be best. Conversely, if you show anxiety, apprehension, or frustration with your pet, or if you try to use punishment to stop undesirable behavior, you will likely make your pet more anxious. Knowing your pet and its individual temperament will help determine what situations you can and should expose your pet to. There is a phenomenon called ‘one trial’ learning, where an event is so traumatic that only one exposure can create fears, phobias, or anxieties. How can these problems of fears and phobias be treated? Each time your pet is exposed to an anxiety, fear, or phobia-inducing situation and is unable to calm down, the problem is likely to worsen. Finding a way to control, relax, calm, or distract your pet in the presence of the stimulus is needed to correct the problem and to teach your pet that there is nothing to be feared. This usually entails teaching the pet a new response when it is calm and not in the presence of the fear-provoking stimulus. A pet’s fear and anxiety will be lessened by an owner who is calm and in control. For most cases of fear, behavior modification techniques, where the pet is exposed to mild levels of the stimuli and rewarded for nonfearful behavior, are utilized. For low levels of fear or anxiety, especially when the pet is being exposed to new stimuli, many pets will calm down with continued exposure, as long as nothing is done to aggravate the fear. Consequences that reinforce the fearful behaviors (inadvertent rewards or retreat of the stimulus) or aggravate the fear (punishment) must be identified and removed. Exposure to stimuli that have an unpleasant or negative outcome (e.g., an aggressive dog, a child that pulls the dog’s tail) also serve to instill further fear. Drug therapy may be a useful addition to behavior therapy techniques and may be necessary in the treatment of some phobias.